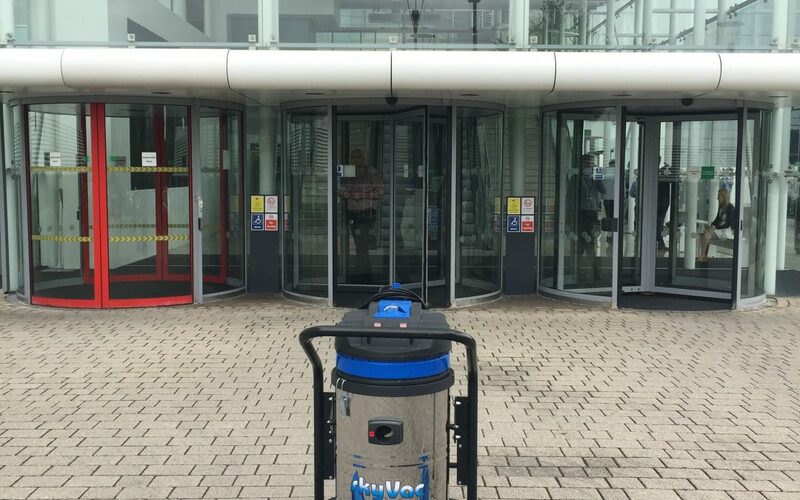 The SkyVac team were delighted to be given the opportunity to demonstrate the unique SkyVac 78 Internal High Level Cleaning System to the Nationwide Facilities Management team in the imposing Atrium area of their Glass fronted HQ building, at their headquarters in Swindon. Coincidentally the same as SkyVac, Nationwide’s origins lie in the county of Northamptonshire with early links to the Northampton Town & County Freehold Land Society. The SkyVac system was stretched to its full height capacity in this enormous open spaced arena. By utilising the distinctive user friendly superlight weight carbon fibre poles and the adaptability of the cleaning end tools the team was able to successfully demonstrate the versatility and capability of the SkyVac 78 Internal high level cleaning method. Yet another National Institution with its high level cleaning requirements answered with the SkyVac.